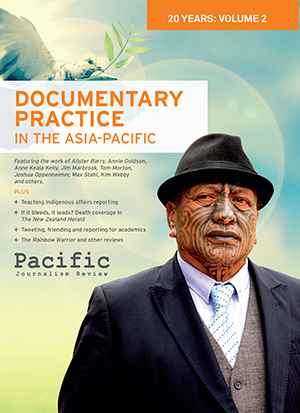 The Pacific Journalism Review, founded at the University of Papua New Guinea in 1994, is a peer-reviewed journal covering media issues and communication in the South Pacific, Asia-Pacific, Australia and New Zealand. It is now published by the Pacific Media Centre, AUT, and has links with the Australian Centre for Independent Journalism and the University of the South Pacific. While one objective is research into Pacific journalism theory and practice, the journal is also expanding its interest into new areas of research and inquiry that reflect the broader impact of contemporary media practice and education.A particular focus will be on the cultural politics of the media, including the following issues – new media and social movements, indigenous cultures in the age of globalisation, the politics of tourism and development, the role of the media and the formation of national identity and the cultural influence of New Zealand as a branch of the global economy within the Pacific region. It also has a special interest in environmental and development studies in the media and communication – and vernacular media in the region.